Advances in rod technology and the introduction of braided/fused has completely transformed tuna jigging. Both conventional (casting) and spinning tackle can be used. The spinning tackle is certainly easier to use, but the conventional tackle allows the angler to excerpt more pressure on the fish. The recommended tackle found here is suitable for tuna of 20lbs and up. 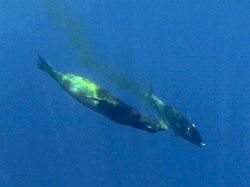 Lighter tackle can certainly be used for the smaller tuna. 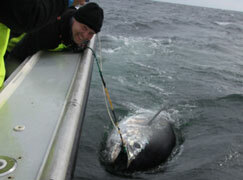 The heaviest rods can handle some of the largest yellowfin tuna and most bluefin tuna. Once these fish get over 150lbs, the angler will certainly need every bit of skill to get these fish to the boat. High-end reels are an absolute must. The high speed runs from big tunas will simply melt the drags on many spinning reels. There are very few “economical” reels that can withstand the punishment. Line capacity is also a major consideration. 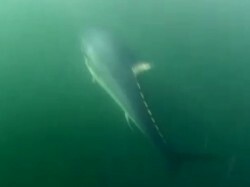 A big tuna can rip 100yds out of a reel in just a few seconds (and they can still dive deep). The rod we recommend for tuna jigging is a 5’6″ to 6’6″ spinning rod rated for 50lb braid or higher. Going to higher rated rods will allow the angler to put more pressure on the fish, but will reduce casting distance and negatively affect the action of lighter jigs. The reel must be able to hold at least 300yds of line (400yds+ preferred). We recommend loading the reel with 50-65lb Spiderwire Ultracast Ultimate Braid. This is a very tough coated braided line. It not only casts well, but is resistant to wind knots, and is more durable than any other braid. The breaking strength of this line is typically much greater than the actual rating. 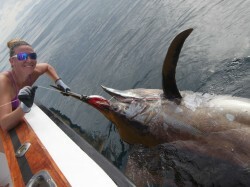 The rod we recommend for tuna jigging is a 5’6″ to 6’6″ conventional rod rated for 50lb braid or higher. Going to higher rated rods will allow the angler to put more pressure on the fish, but will negatively affect the action of lighter jigs. The reel we recommend should have lever drag and at least a 5:1 gear ratio. It must be able to handle 50lb braid or higher. The thin diameter of the braided lines will allow the jig to sink quickly (and maximize line capacity). The lack of stretch will ensure the best possible action for the jig. The breaking strength of these lines are typically much greater than the actual rating. We use a three foot 50lb-80lb fluorocarbon leader. We connect the leader to the braided line using a 100lb barrel swivel. The small profile of the swivel virtually eliminates any chance of picking up debris. Some anglers may want to make a direct connection using an albright knot or a wind-on leader. The leader should be tied directly to the solid ring on the jig. There are many styles of jigs and colors. We recommend having a selection of 6-8″ flat jigs and 10-12″ knife jigs. We also recommend putting two assist hooks on every jig. The line and the assist hooks should be attached to the solid (or welded) ring. A split-ring is used to attach the jig to the solid ring.